Two years ago, Sphero released its BB-8 droid to coincide with the beginning of a new Star Wars trilogy. It was not only adorable and incredible fun, but it actually had personality in a way few toys do. 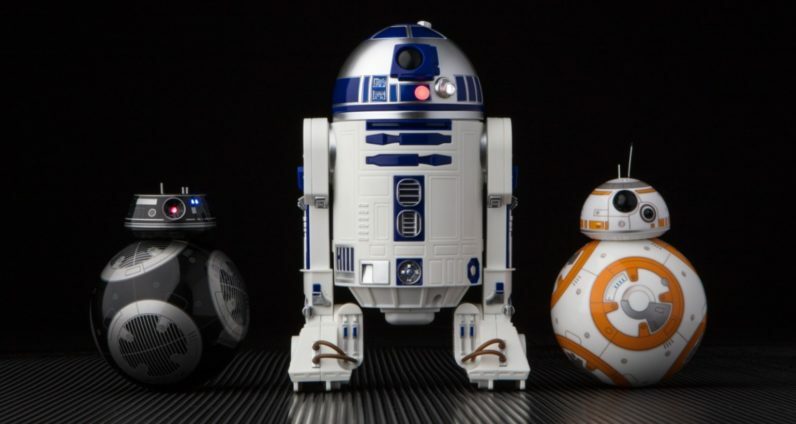 Now the company is bolstering its line-up with something new and something old: a mysterious new ‘BB-9E,’ and the original lovable droid, R2-D2. BB-9E hasn’t been seen on screen yet, and Sphero won’t say much other than that it’s “a menacing astromech droid of the First Order.” It moves around in the same rolling fashion as BB-8 that looks incredibly futuristic, even if it’s prone to slip and slide on my hardwood floors (it’s much better on a rug or concrete). The difference is in the personality. Instead of BB-8’s cheerfulness, BB-9E is like its cranky evil twin. The droid makes menacing-but-still-adorable beeps and boops while idling, and you can activate a variety of expressions via the remote control app. You can make it say yes or no, yell out what appear to be droid expletives, and do a bunch of other stuff. Sphero says it has a team of animators working on the expressions, and it shows. But then there’s the R2-D2 toy. It’s larger than either of the BB models (to scale), and decidedly not a robot soccer ball. It’s also one of the best Artoo toys I’ve seen, certainly at this price point and size. Again, it comes down to Artoo’s personality. Unlike most of the droid’s remote-controlled toys, which can only roll around your floor and turn their heads, this one includes a total of four motors that recreate R2’s signature wobbles. The droid also automatically shifts from bipod to tripod mode when it starts moving. This all adds a ton of character, and it doesn’t hurt that the sounds actually emanate from the droid itself – not to mention Sphero is actually sampling sounds from the original Star Wars archives. Side note: be warned if you have a dog. My dog went crazy over both droids, thinking they were some new magical chew toys. Thankfully the toys are meant to be durable, and survived mostly unscathed. There’s a lot more than just remote control features. The droids are all controlled via the same app, and you can actually have the toys interact with one another, or react to watching the Star Wars movies with you. You can program them to follow preset paths, or ‘patrol’ your home (there’s no camera, so its mostly just moving around and bumping into things). And with app and firmware updates, Sphero says there’s more goodness to come. The droids go on sale for tomorrow’s Force Friday. R2-D2 is $170, while BB-9E is $150. You can expect to see them under a lot of Christmas trees this year.